Seriously. I don't think I can handle any more TV featuring arguing idiots, people trying to look good in front of the camera, and folks basically lying about everything. Enough is enough. Some one get "Jersey Shore" off the air. You thought I was talking about the presidential race and debates. OK you caught me. I was but I just wanted to have a little fun with you. Speaking of fun, here are some excellent Twitter comments regarding the VP debate last night - which I did not watch but I saw some highlights and read some news articles today. Good times. I will be so glad when the race is over so we can get back to the important issues like complaining about the Kardashians. Joe Biden's having a scotch right now while Paul Ryan's mom is putting his "debate participation" certificate on the refrigerator. Paul Ryan slams the door to his room and cries into his Jolly Rancher novelty pillow. "AAAAAAARGH I HATE HIM I HATE HIM I HATE HIM"
Biden's not really taking notes. He's just writing LOL LOL LOL on the back of his hand. Joe Biden is like a poor man's Jim Carrey, but Paul Ryan is like a poor man's worst nightmare. Biden's teeth are so white they've already voted for Romney. While Ryan speaks, Biden looks like he's trying to order a drink at the bar and the bartender is ignoring him. Joe Biden keeps laughing during the debate because he can’t stop thinking about Air Bud dunking a basketball. I hear Joe Biden is pretty excited about getting to stay up late this evening. What if tonight's debate just opened with Biden breaking a barstool over Ryan's head? No one has a harder job today than the Secret Service agent who has to keep confiscating pairs of brass knuckles from Joe Biden's pocket. Paul Ryan being coached not to kiss his biceps when asked about "gun control." 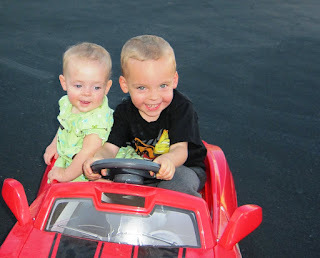 Kyle cruising with Little Miss Hayden. Man oh man I love those two kiddos so much. Loved the selection of 'true' funnies. What gets me about those debates is that they show them on MY television, and I don't mean on the worldwide programmes.... I'm talking about our everyday LOCAL television programmes. Great picture of Kyle and Hayden. Gorgeous children. Have a brilliant weekend. excellent points on the debates. i was surprised to learn that biden and "bibi" netanyahoo were drinking buddies. great picture of kyle and hayden. Don't tell me you Americans are having another Presidential election. Already? What is wrong with that nice bloke you already got? He deserves a chance to mess things up properly. I found the VP debates highly entertaining. Joe Biden made me want to dance with him. Is that wrong? The SNL skit they did on the VP debate was incredible! So funny, I had water spew from my nose. That is a great picture. You can really tell they're siblings when they're side by side. Biden is a braying jackass. No surprises there. I like the kid in the car and his running mate next to him. They got my vote.